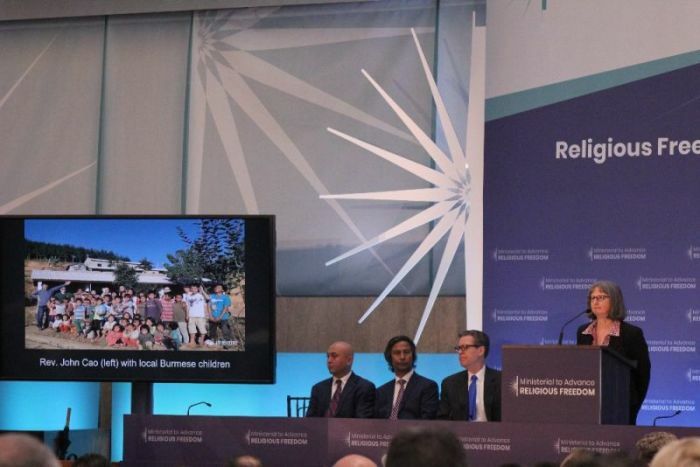 WASHINGTON — The daughter of imprisoned American pastor Andrew Brunson gave an impassioned speech during the first-ever State Department Ministerial to Advance Religious Freedom, choking up a bit as she shared how her father feels "blessed" to suffer for his faith in Christ. 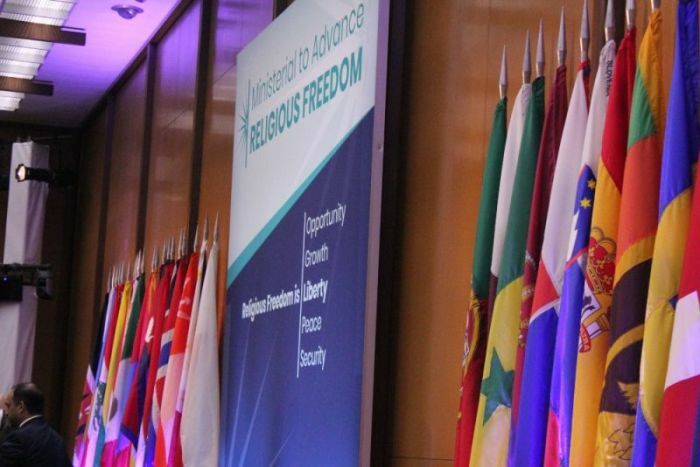 Jacqueline (Brunson) Furnari was among the family members of persecuted believers who shared the stories of persecution that their respective loved ones have faced at the State Department headquarters Tuesday, kicking off a much anticipated three-day conference on international religious freedom that the federal government has never hosted before. "I know my dad's character as only a daughter can, and I know the charges against him are absolutely absurd and false," she told the hundreds gathered at the Harry S. Truman Building, asking them for prayers for her father's release. "He is not an armed terrorist trying to overthrow any government. He is a pastor who went to Wheaton College and on to seminary and got a Ph.D. in New Testament." For the past two decades, the North Carolina native has served the Turkish people as a church leader in Izmir. But on Oct. 7, 2016, Brunson was arrested and held for over a year before finally being charged with having connections to Kurdish militants and the Islamic Gulen movement that the government accuses of staging the July 2016 coup attempt against President Recep Tayyip Erdoğan's government. 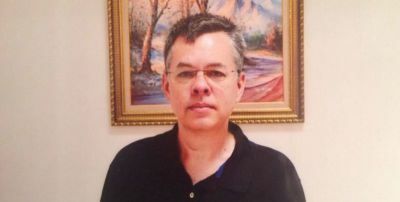 The pastor has maintained his innocence and pressure from the U.S. continues to build as prominent lawmakers have said that the prosecution lacks credible evidence and have long called for his release. Last week, Brunson appeared in court for his third hearing. Despite hopes that the court would release Brunson, he was again remanded back to prison until his next hearing in September. "It is important to note that during these three [hearing] dates, there has not been one prosecution witness that has been able to provide one shred of evidence that support their ridiculous testimony — a fact that my father pointed out during the May 7 trial date and a fact that none of the judges on the panel seem to care about," Furnari said. "The head judge personally told my father that all the prosecution's witness testimony is simply being taken as truth therefore there is no need for any evidence." As the testimonies of the prosecution's secret witnesses appear to be based off of second and third-hand information, United States senators have equated Brunson's imprisonment to an attempt by the fellow NATO member nation at hostage diplomacy. Erdoğan has even suggested himself that Brunson's fate is tied to United States-based Islamic cleric Fethullah Gulen. Furnari, who grew up in Turkey and graduated from the University of North Carolina, told the crowd that her father has missed two of the most important days of her life because the Turkish government has decided to use her dad as a political pawn. Furnari got married in civil court in February 2017, despite the fact that she had picked out a wedding dress and was excited to have the wedding of her dreams. But because of her dad's imprisonment, she and her husband have decided to hold off on having a big church wedding until her father is able to come home and walk her down the aisle. "I got married and neither of my parents were present. I will never get that moment back," she explained. "For those of you that have daughters, I know that you understand how important and special it is for both you and your daughter to walk her down the aisle at her wedding. My father didn't get to do that. I am still waiting for my wedding and I am still waiting to wear the wedding dress that I got more than two years ago. I am still waiting for my dad to walk me down the aisle and I am still waiting for my father-daughter dance." Last December, Furnari graduated from college. "One of the ways that my father has shown his love to my brothers and I is that he has invested so much in helping us plan out our futures and our career paths. He missed seeing me achieve yet another life milestone," she added. "My brother is graduating from college this coming December as well. He would love to be at least at that one." Furnari explained that although her dad has lost at least 50 pounds in jail and looked to be a shell of his former self, he has explained in letters that the thing that has pained him the most about his imprisonment is missing out on spending time with his family. Furnari added that Brunson has missed out being there for her older brother to help him make career choices and seeing his accomplishments at Cornell University. Brunson has also missed out on being there for his younger son, who is in his senior year of high school. "These are the things that pain my dad the most — not being able to be with us and missing out on life with his family," she said. Furnari has been able to visit her father in prison just once in August 2017. She was shocked to see her dad in such a poor condition. Suffering from anxiety and depression, she stressed that her dad has lost hope. "[He] has been permanently changed by this experience," Furnari asserted. "Even when this ordeal is over, he will never be the same person that he was." Furnari was emotionally choked up as she said her father has handled his false imprisonment in a manner that has displayed "Christ's love" to the world. "In his trial last week, my father forgave the witnesses who falsely testified against him, saying, 'My faith teaches me to forgive, so I forgive those who testified against me.' He went on to say, 'It is a privilege to suffer for the sake of Christ,'" Furnari said as she again choked up with emotion. After encouragement from the crowd, Furnari continued by quoting her father's testimony from last week's court hearing. "'Blessed am I as I suffer for Him. Blessed am I as I am slandered. Blessed am I as I am lied about. And Blessed am I as I am imprisoned. Blessed am I to share His suffering,'" she cited. Pam Pryor, the State Department's senior adviser to the undersecretary of civilian security, democracy and human rights who introduced Furnari at the ministerial, vowed that officials at the State Department are "focused" on Brunson's case. "I have worked here at State and I know how focused everyone is on Andrew Brunson. We get weekly updates and this administration is truly working on ways to make sure that this innocent American and others wrongfully detained are released," she stressed. "Just like we saw this administration bring home a young man from Utah imprisoned in Venezuela recently and three Americans forcefully detained in North Korea as we watched them deplane in the middle of the night at Andrews Air Force Base, one day soon, we all want to be at your father's arrival ceremony on U.S. soil." 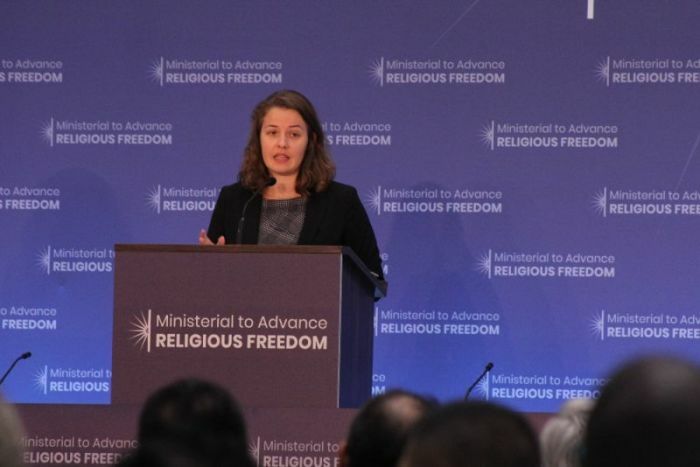 Also speaking at the ministerial was Jamie Powell, the wife of imprisoned Chinese pastor and missionary John Cao. Cao is serving a seven-year prison sentence in China. Cao helped build 16 schools for the Wa people in the Shan state of Myanmar. However, authorities in China detained him while he was doing humanitarian work along the Myanmar-China border in March 2017 and convicted him on charges of organizing illegal border crossings. Such a charge is usually given to human traffickers. "It appears to me that John was set up for his arrest because of his faith-driven work," Powell told the ministerial Tuesday morning. "Since his detainment, my husband has suffered a rapid decline in his health. He has lost 50 pounds. He has not been able to communicate with me and my children. My sons and I traveled there — 10,000 miles — and we were not allowed to see him," she added. "The seven years he has unjustly received now becomes a matter of health and survival." Peter Bhatti, the brother of slain Pakistani Christian politician Shahbaz Bhatti, also spoke at the ministerial. Bhatti was murdered in 2011 over his advocacy for reforming the nation's strict blasphemy laws, which are often used by majority Muslims to settle personal disputes with religious minorities and is a large reason why Pakistan is ranked as the fifth-worst nation in the world when it comes to Christian persecution by Open Doors USA. Bhatti assured the crowd that his brother's death was not in vain. Firsthand victims of persecution also spoke Tuesday. Tahrir Hamut, a prominent Uighur poet, recalled how he was sentenced to three years in a labor camp in China in 1996. He warned that today, there are over 1 million Uighur Muslims in concentration camps in China. He fears they could one day face Nazi-style mass killings.